What do you get if you cross a gold dog with a telephone?............. A Golden Receiver! Why does a cat bury their feces and urine? Could it be to cover their scent from potential predators? We think so. Find your perfect dog mat to keep messes down and your happy factor up! PetHangout offers a large variety of dog mats from our Hungry Dog Feeding Collection. We are proud of our great assortment of mats and encourage you to browse to find one for your pet needs. Mats help keep messes in one spot and saves your floor from stains and damage. Your doggie will appreciate a groovy cool mat too! Hip Designs - We have colorful designs like this raspberry mat that cleans easily. 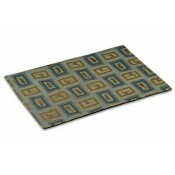 Lipped - This green mat is nonskid and has a lip to keep food and water on the mat. Anti-microbial - This mat is great for not only feeding but also outdoors or in crates and kennels. Questions on our dog mats? Drop us a note or call 877-860-1278. We will get right on it! Dog Food MatPetHangout offers this cute dog bone shaped Dog Mat from our premier&nbs..
DOG MATPetHangout is so excited to offer this one of a kind Dog Mat from our beautiful Dog Mats ..
Dog Mat - Steak Have you ever wanted to wind and dine your doggie or puppy?Well, .. Feeding Mat - MediumPetHangout is so excited to offer this fashionable Dog Mat from ..
FOOD MAT - SMALLPetHangout is so excited to offer this small Dog Mat from our premier&..